Jane represents individuals, businesses and developers in matters pertaining to real estate, business practices and contracts. She is also a trained mediator, who conducts mediations regarding real estate, construction, contract and other disputes. Successfully had zoning amendments in two different townships declared invalid because townships failed to follow proper notice procedures. Successfully aided family members defend quiet title action, paving way for sale of jointly owned land to developer. Represented many landowners in negotiations of easement offers related to Sunoco’s Mariner East 2 project and secured fair compensation for clients. Successfully defended individual in breach of property settlement agreement action and secured award of costs and attorney fees. 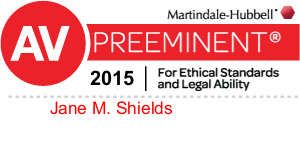 Represented many landowners in eminent domain proceedings in both state and federal courts. Represented individual shareholder in trial against the two majority shareholders that resulted in a verdict for the full value of the minority shareholder’s interest in the company. Represented homeowners in suit against sellers and others in a jury trial that resulted in a jury verdict finding that the sellers had defrauded the buyers. Represented business in dispute with equipment manufacturer that resulted in a verdict for the business in the full amount of the value of the replacement equipment. Defended Assistant District Attorney in civil rights action, resulting in dismissal of suit against the attorney.